His comment brought back memoriesâ€”fresh avocado slices sprinkled with sugar, served in a Shan State village; a sweet avocado shake I drank during a downpour in a remote Cambodian province. Many Asians view the avocado as dessert. 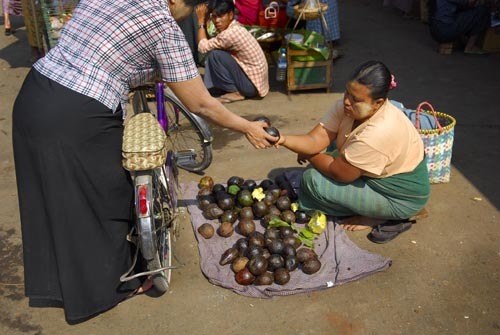 Two things of note: the Burmese make great salads, and they grow tasty avocados. Combine these two elements, and you have one grand guacamole. Burmese salads tend to focus on a single vegetable, fruit, leaf or rhizome with several key ingredients for flavor, fragrance and consistency. As Mi Mi Khaing wrote in Cook and Entertain the Burmese Way, a salad should contain a balance of salty and sour flavors, moistness counteracted by a flour to sop it up; an oil for blending; and chile, onion, garlic, herbs and spices for aroma and color. Our guacamole consisted of a typical Burmese salad, made with avocado. It varied slightly each day. How to make it? Mix avocado (sliced or smashed) with oil (peanut or sesame), chopped tomatoes, sliced shallots, garlic if you like, chopped cilantro or culantro, chopped fresh chile, fresh lime juice, salt and — this is key — ground, roasted chickpea or peanut powder. Add sesame seeds if you like, too. Very simple. I can’t wait to get back in my kitchen! One more thing: the definition of salad in Burmese, lethok, implies that it is mixed by hand. So go ahead and have some fun with your guac. Get your hands messy. Thanks for elucidating the ingredients of Burmese guac. Ground roasted chickpea…clever. In this way, Burmese cuisine really inspires experimentation in the kitchen. And the Asians who think avocado a dessert have the right idea. After all, no one said you couldn’t eat dessert first. Interesting! I didn’t realize avocado was cultivated in Burma. The salad concept is intriguing, with the notion of using the starch to soak up juices. Btw, avocado makes a great pie for dessert. I was given a simple recipe from Mexico, by a friend several years ago. Delicious! Jim, I’d wondered if avocado was a new-ish import from China or elsewhere, but the folks I asked said they’d been eating avocado as long as they could remember. Avocado pie…. sounds yummy.